Celebrity engagement rings are some of the most stunning diamonds you will ever see. The cost of some of these diamonds could feed a small country! To put this list in perspective, the average cost of an engagement ring in America is $5,431. The ‘cheapest’ ring featured on this list is $500,000, and the most expensive ring is worth $8.8 million. Here is a list of some of the most expensive diamond rings a few lucky girls wear. All time favorite engagement rings for women around the world is the one Prince William gave Kate Middleton for their engagement. This is one of the most iconic rings on the planet because it’s the same ring worn by Prince William’s mother, Princess Diana. 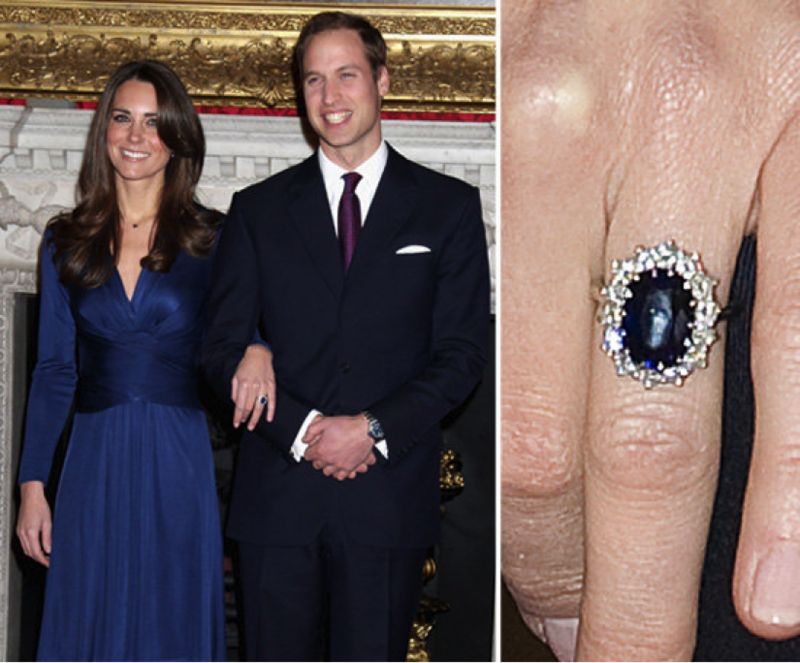 This 18-carat oval blue sapphire ring cost $60,000 at the time Princess Diana wore it, but is now is worth around $500,000. Recently, the most eligible bachelor George Clooney proposed to the British lawyer Amal Alamuddin. 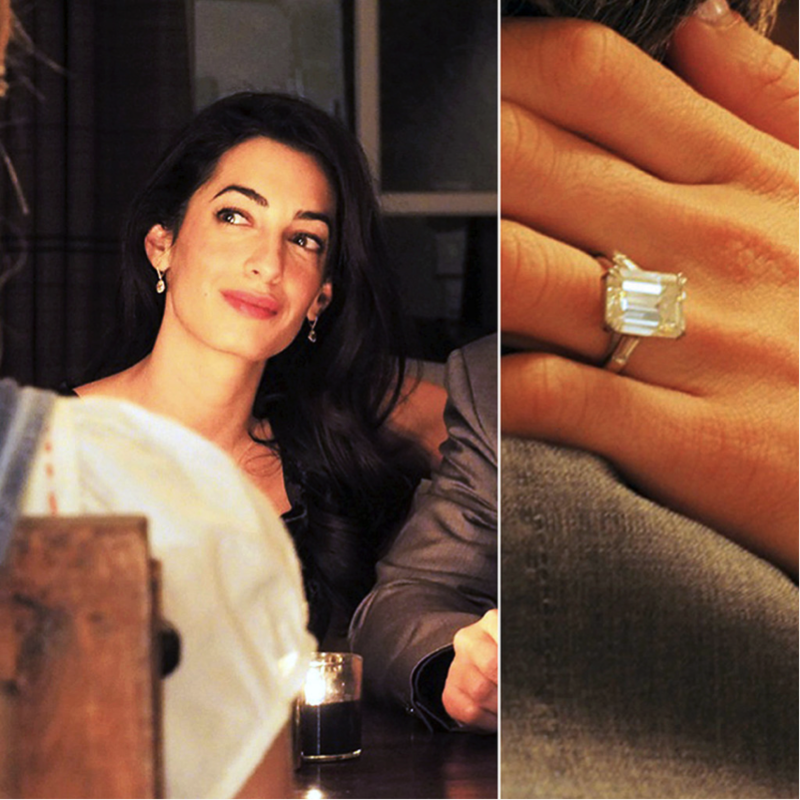 Clooney gave his girlfriend, now fiancé a 7-carat ethically-sourced diamond ring when he proposed engaged in April 2014. The estimated cost of the emerald-cut diamond is $750,000. Kayne West spared no expense when he gave Kim Kardashian her engagement diamond ring. He designed the 15 carat diamond ring with famous jeweler Lorraine Schwartz. The estimated cost of this stunner is $1.25 million. #7. When veteran actor Michael Douglas gave his wife Catherine Zeta Jones an engagement ring, the bill came out to $2.5 million. The diamond ring he gave her was a 10-carat vintage, marquise shape stone. #6. 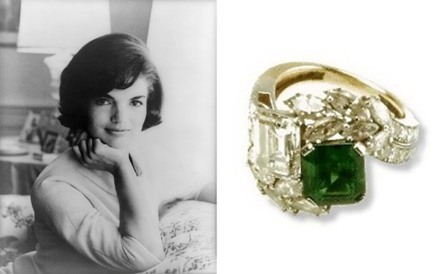 One of the most expensive diamond rings in the world was only worn twice by Jackie O, and remains in a bank vault in New York. The Lesotho III 40.42-carat diamond ring was one of only 16 cuts from a 601-carat rough diamond discovered in South Africa. The cost of this unique ring is $2.6 million. #5. Donald Trump gave his 3rd wife a 15-carat emerald cut House of Graff diamond ring. The cost of this pricey rock was $3 million. I guess he’s hoping 3 is his lucky number! #4. When Marc Anthony gave ex-wife Jennifer Lopez the engagement ring, cost of the diamond ring was $4 million. This massive 8.5-carat ring has one of the rarest diamonds in the world. I hope he had the receipt and bought it from a store with a good return policy since their marriage didn’t last! #3. 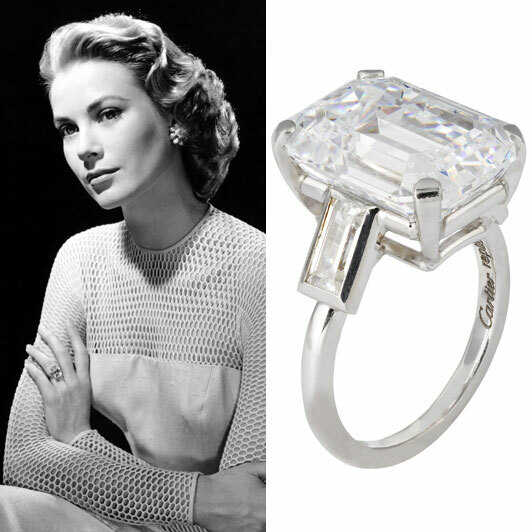 One of the most iconic actresses in the world should only wear one of the most classic diamond rings. When Grace Kelly married Prince Rainer III, she wore a 10.47-carat Cartier emerald-cut diamond that cost a whopping $4.06 million. #2. 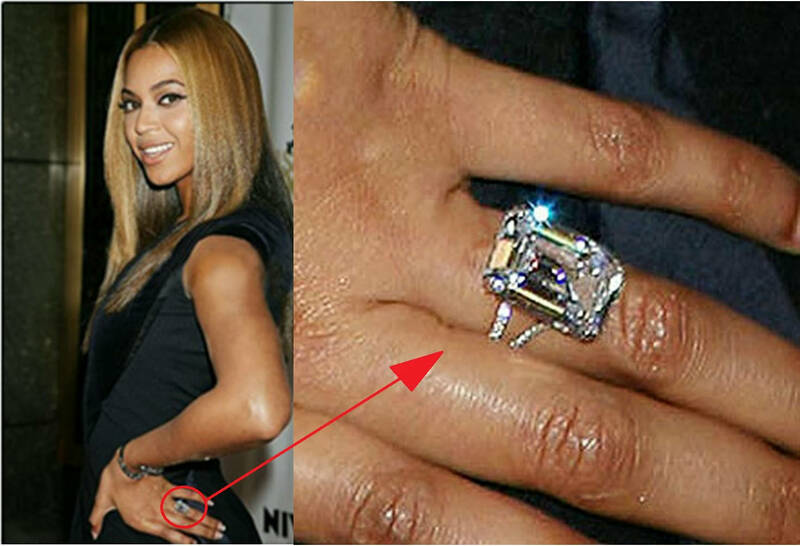 The Queen of Pop, Beyonce holds the #2 spot for having the most expensive celebrity ring. Jay Z aka Sean Carter gave his wife-to-be an 18-carat flawless octagon cut ring designed by Lorraine Schwartz. This enormous rock cost a cool $5 million. That’s pocket change for Jay Z! #1. The most expensive celebrity engagement ring goes to Elizabeth Taylor. 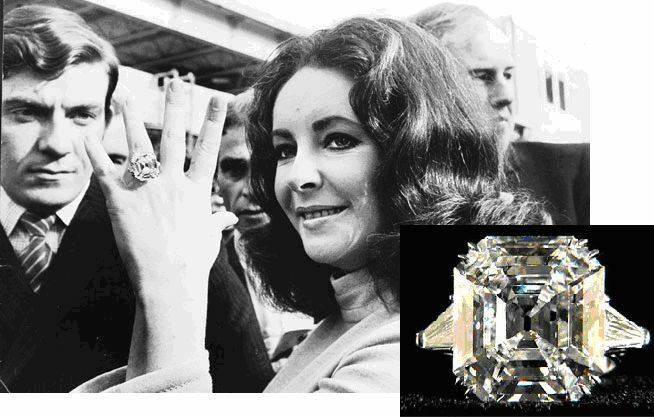 Richard Burton gave her a huge 33.19-carat Asscher-cut Krupp diamond. The value of this massive ring is $8.8 million! In December 2011, Christie’s auctioned the engagement ring to an unnamed Asian collector. Some lucky girl out there is smiling right now! Now, if people want to come back to earth and look at more affordable diamonds, take a look at www.diamondhedge.com. An excellent website for diamond price comparison, that provides a diamond filter for shape, cut, clarity, color, carat, and price. This website aggregates loose diamonds available from the world’s leading jewelry companies, such as Zales, Blue Nile, and Kay Jewelers into an easily searchable database. When you are ready to purchase a diamond, diamondhedge.com is a great resource to use to make sure you find the best price available.